Everyone gets a sore throat from time to time, and sometimes the tonsils in your mouth can become infected. However, tonsils are not the only vulnerable glands in your mouth. Adenoids, located higher up in the mouth -- behind the nose and roof of the mouth -- can also get infected. Enlarged and inflamed adenoids -- called adenoiditis -- can be painful and make breathing difficult. 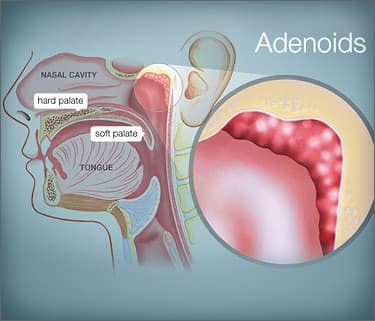 Adenoids are a mass of tissue that, along with your tonsils, help keep you healthy by trapping harmful germs that pass through the nose or mouth. Your adenoids also produce antibodies to help your body fight infections. Unlike tonsils, which can be easily seen by opening your mouth, you cannot see the adenoids. A doctor has to use a small mirror or special instrument with a light to see the adenoids. Sometimes X-rays may be taken to see them more clearly. While adenoids play an important role in keeping a person healthy, as you get older, adenoids become less important because your body is able to fight infection in other ways. In fact, adenoids often get smaller around age 5 or 6 and virtually disappear by the teen years. Even though adenoids help filter out germs from your body, sometimes they can get overwhelmed by bacteria and become infected. When this happens they also get inflamed and swollen. This condition is called adenoiditis. It is most commonly seen in children, but sometimes affect adults. Adenoiditis is treated with antibiotics. However, if your child has frequent infections, including ear and sinus infections, or antibiotics do not help, or if your child has ongoing breathing problems, surgery may be needed to remove the adenoids. This procedure is called an adenoidectomy.